I’m not a great singer, but I’ve always liked singing. Several of my children sing in church and with a small chorus, but they’ve never really had any vocal teaching. I sang in the choir and a girl’s ensemble when I was in school and there are things I learned that I still use today. I’ve taught the little I know to my children but I’ve always wanted them to have more instruction. “Vocal Coach Singer is the most complete instructional singing system available with the equivalent of over $2,000 worth of personal coaching time. Whether you are a beginner or a professional, Vocal Coach Singer teaches and builds upon the fundamentals essential to an accomplished singing voice. From posture to performance our tested and proven techniques will help you deliver your songs with consistency and confidence!” Browsing The Vocal Coach website, I don’t have to be a mathematician to know that “$2,000 worth of personal coaching time,” for every Junior High, High School student; and adult in my house, for $99.99 – MP3 format or $119.99 for 12 CD’s and Instructional Guidebook could be an outstanding value if it is what it says it is and does what it says it does. 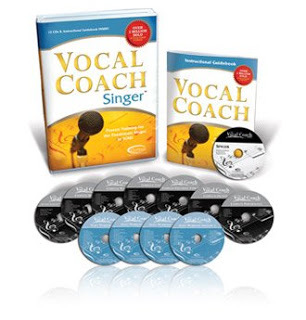 Vocal Coach Singer includes Training CD’s, Workout CD’s and a CD of printable lead sheets for all of the vocal exercises and printable individual singer’s journal pages; plus an Instructional Guidebook. My girls have been using this interactive program for several weeks. We set aside an hour or two, two to three times a week, for music class. Using the Training CD’s, they have learned to breathe, how the voice works, proper posture, tone; and pronunciation. They’ve discussed song choice, facial expression, hand gestures and more in the deliverance of an excellent performance. “Learning to sing well is a process,” says Chris & Carole Beatty, the founders of The Vocal Coach. They have taught and coached thousands of singers over the past 40 years. The Instructional Guidebook is a full-size, 9 page booklet with clear information and important principles designed to remind and reinforce the material presented in Vocal Coach Singer. Chris & Carole Beatty make themselves available for questions and assistance with any of their coaching products, through their website. You can contact customer service@rede-commerce.com or call 615-280-0554. So, I can say The Vocal Coach, Vocal Coach Singer is what it says it is and it does what it says it does. It is well worth the investment toward creating better singers and more confident speakers. As always, you can read other reviews by my Crew mates when you click on the banner below. Disclaimer* I received a physical copy of Vocal Coach Singer in exchange for my honest review as a member of the Schoolhouse Review Crew. I receive no other compensation for my reviews on this blog. The opinions expressed are my own. 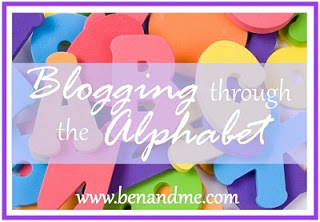 When I saw that they were on the letter J I immediately had my title – J is for “Just Beginning.” I am just beginning to blog through the alphabet and I can’t wait to see where this prompt will take me each week! or jumped right in with F – for Finally Starting. I was rather discouraged to see they were on G and I was Getting Nowhere Fast. which is why I am at the letter J and Just Beginning. Sometimes, you gotta Just Do It! Jump In with Both Feet! Don’t put off until tomorrow what you can start today, ’cause you might not have tomorrow. Today’s a new day! I’m just beginning to see the possibilities and I hope you will too. 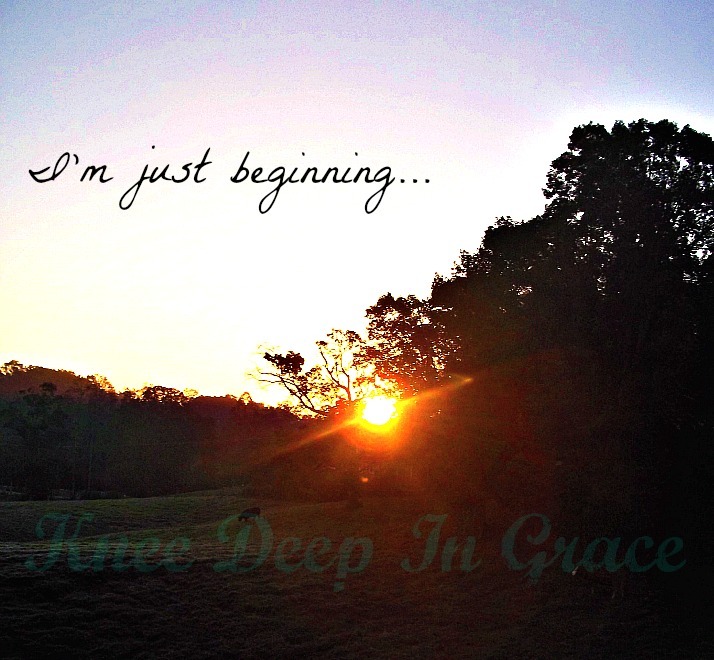 *Contents and photographs of this blog are copyrighted, they are the property of Knee Deep In Grace and may not be used without written permission. Virtue is behavior showing high moral standards. It is more than chastity or the abstention of a pre-marital sexual relationship. It is choosing to be set apart, as Scripture calls it, from the things of this world. Choosing to be unaquainted with evil, not just in our choices of friends or relationships; but in our choices of movies, books, music etc. Virtue is having purity in conduct and intention. As a mother to many children of both genders I can tell you that it is still desirable and possible to raise virtuous children. The keyword in the sentence is raise, because I can just as assuredly tell you that we are not born to virtue. 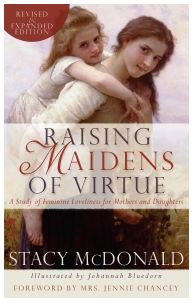 Stacy McDonald has written a book, Raising Maidens of Virtue, to aide mothers and daughters on their journey to womanhood. It is published by Grace & Truth Books in a lovely hardcover binding, for ages 8-15. It is more of an intimate conversation than a Bible Study, but the results of guidance are the same. Stacy shares the truth of God’s intention toward modesty, real beauty, guarding the tongue, homemaking, contentment and more, through stories, illustrations, and memory-making projects; with a sensitive heart-to-heart tone. She leads us through the hard questions and the uncomfortable places never straying from Scripture. I wish I had had this book years ago and I have no doubt I will use it as my younger girls continue to grow. It’s my opinion that every Christian household with daughters would benefit from reading this book. It is a treasure and worth more than the $18.50 that it costs to purchase it. My Crew mates recently had the opportunity to review several books published by Grace & Truth Books and you can read their opinions when you click the banner below and follow the link. Disclaimer* I received a copy of this book in exchange for my honest review as a member of the Schoolhouse Review Crew. I receive no other compensation for my reviews on this blog. The opinions expressed are my own. Day 5 ~ Rejoice with Me! I am thankful that no matter how things appear – God is still on The Throne! A couple of weeks ago our refrigerator stopped working properly. Then, less than a week after that, our car started making a troubling sound – it needs a new transmission. Oh, my! Today, my husband’s old truck left him stranded on the road. Presently it is dead! Oh, oh, my! Inevitably, there always seems to be some sort of shakin’-up going on around here; but not one of these incidents alone or even combined is bigger than our God. Rejoice with Me, because He is faithful and I can toss the entire complicated, financially impossible burden on Him. Rejoice with Me, not in the hardships but in the knowledge that God will bring us through the hard areas and the difficult times. Rejoice with Me! God IS sovereign! He is The Almighty, The Possessor of all power in Heaven and earth. His counsels cannot be defeated nor His purposes thwarted. Nothing happens without His permission! There is wisdom in being prepared for battle – having the proper protection and weapons in good working order, having no doubt who you’re fighting for and why you’re fighting; being familiar with the lay of the land and the tactics of your enemy. Reconnaissance is defined as an exploratory military survey of enemy territory. It has its origins in the Old French word, reconoistre – meaning to recognize. This is where we get the shortened word recon. A successful recon mission gives us strategic intelligence that can be compiled and used against the enemy. As Christians, our enemy is the devil; and God’s Word enlightens us to his ways and deeds. The Bible is our own Strategic Intelligence Manual from The Creator of the Universe. It is God’s revealing of The Truth to us. Recon is a high school Bible Curriculum, developed by Bill Perry. It is specifically designed for grades 11 – 12 as they prep for college, but can be adapted to include 10th graders; those already attending college and adults. Its purpose is to help us, as parents and teachers, to spiritually equip our children/students to be victorious in battle – “the internal battle for integrity, Godliness, humility and obedience [Micah 6:8, Romans 7:15]; and the external struggle for The Gospel to be heard and believed among the nations [Ephesians 4:15, John 14:6];” to help them bridge the gap between and transition from high school to college and beyond without wavering in their faith. Military images, graphics and terminology are used to help maintain the seriousness, focus and discipline necessary to successfully complete the mandate of Jesus Christ. This Bible Curriculum “is different because (1) college preparation is the whole framework for this curriculum and (2) it is reinforced with a national web-based network.” It is “college ministry before college.” I think the potential is extreme! My husband has led me and our children, ages 22, 20, 18, 16, and 14, through this course for the past several weeks. Using the oversize, coil-bound 300-plus page Recon Teacher’s Manual and the Recon Spiritual Training Manual for Students Workbook, we are working our way through 72 intense spiritual lessons of Recon Boot Camp. The military lingo has bogged us down on occasion, but the more we’re trained to recognize the real warfare as described in Ephesians 6 the more we desire to be like-minded and fully prepared. To maintain optimum focus it is recommended that four lessons, and no less than two lessons, be covered weekly. We’ve been able to maintain three days a week even around full and varied schedules. Generally, in our homeschool I’m the teacher. As I browsed the Recon website though, I hoped my husband would consider teaching the curriculum and let me view it from the student’s perspective. He chose to, but it is stretching him out of his area of comfort; because he doesn’t feel he’s a natural teacher. He’s not used to following a Teacher’s Manual, but it and the general set-up has been easy enough for him to follow. He’s growing and so are we as we sit under his leadership. Recon is written for the Christian school venue, a church-based youth group, or homeschool use and it offers the flexibility that is needed for any of these. The idea is not only to train this generation for the future, but to give them a way to connect and support one another through the battle. Mentors and students form small cell groups that continue teaching, training, growth, encouragement; and outreach. Connections can be made through the website. Please, take a few minutes to follow the links I’ve provided throughout this post and browse the website. My Crew mates have written reviews of this curriculum as well and you can read them when you click the banner below. Do not be discouraged! The Battle Belongs to The Lord and He will be victorious! Disclaimer* I received a copy of this curriculum in exchange for my honest review as a member of the Schoolhouse Review Crew. I receive no other compensation for my reviews on this blog. The opinions expressed are my own.